Not quite straight and not quite curly, wavy hair is one of the most versatile hair textures out there, allowing you to go perfectly polished one day and surfer-girl the next. You can wear it au naturel, smooth it out with ease and even encourage it to hold a curl, but how do you get the best out of your wavy hair? It all comes down to knowing your hair type. This type of wave is fine, loose and sometimes thin. It veers into straight territory, making it easy to style sleek, if you like, or scrunch into a more defined curve. Just make sure that, if you’re dealing with 2A waves, you stick to lighter styling products so as not to weigh locks down. Light foams, milky serums and texturizing spritzes work best. These S-shaped waves and can be thicker in texture than type 2A, meaning they’re more defined. However, they’re also prone to a little frizz around the crown area. To enhance their beachy texture, reach for hydrating masks and shine-boosting mousses that help to tame, add a luminous glow and boost volume through the roots. Verging on curly, this type of wavy hair is tighter than the others, and sometimes thicker and coarser. To balance it out, we recommend sweeping it into a deep side parting that shifts some of the weight. Mid-length and long hairstyles are also better suited to a 2C wave, as they pair perfectly with all that extra texture and volume. Now you’ve decoded your wavy hair type, discover the care and styling products that enhance their curved shape, whether you’re looking to pump up the moisture or add some extra volume. Opt for a lightweight, shampoo with no added sulfates, like Nutricurls Shampoo for Waves, which gently removes impurities and nourishes locks without dragging them down. For waves that require more moisture, alternate with the Nutricurls Cleansing Conditioner for a co-washing cleanser that helps to define every curve. While the Cleansing Conditioner allows you to wash and go without the need for a hair mask, you may want to follow up the Nutricurls Shampoo for Waves with the Nutricurls Detangling Conditioner for Waves & Curls. Use it every time you lather up to eke out any knots and tangles, then thoroughly rinse for lightweight, softly-defined waves that feel beautifully nourished. Once or twice a week, treat waves to the Nutricurls Deep Treatment for Waves & Curls; an intensely-moisturizing mask that smooths frizz and pampers hair back to its most luscious and touchable. Particularly good for 2B and 2C waves that are more likely to be frizzy, it gets to work in just five minutes when massaged through freshly-washed, damp hair. When you need a moisture top-up, try misting Nutricurls Milky Waves through locks. The lightweight, leave-in milk makes hair more manageable without adding weight – an absolute must if you want waves to hold their curvy shape. Spritz it through damp hair after washing or - if dried, styled strands crave extra hydration - spray it into the palms of your hands and smooth through the mid-lengths to ends. 2A waves tend to lack volume, so give them some plumping power with EIMI Soft Twirl 72h Anti-Frizz Foam for a dose of definition that feels ultra-lightweight. It’s the perfect styling fix for fine, thin locks. Meanwhile, 2B waves usually appear more defined from the mid-lengths to ends but can sometimes look a little flat and lacklustre through the root section. Scrunch in EIMI Boost Bounce 72h Curl Enhancing Mousse to encourage extra movement, with the added bonus of veiling locks in frizz-defying shine. 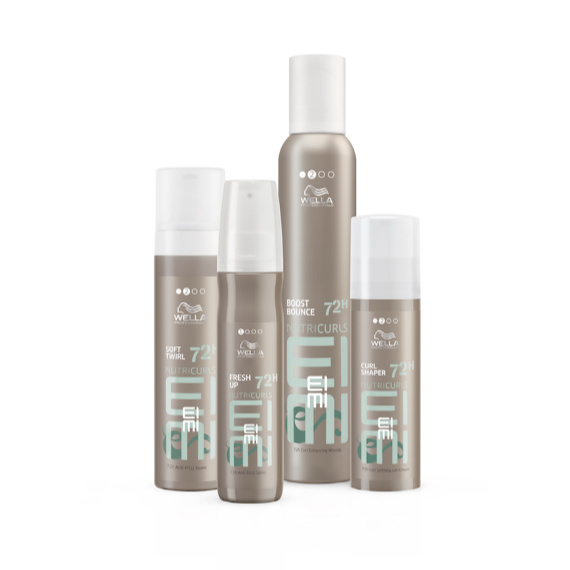 Finally, look for low-hold styling products to enhance 2C hair types, like EIMI Fresh Up 72h Anti-Frizz Spray, which can be spritzed through damp or dry hair to reactivate waves. The Boost Bounce Mousse will also suit 2C waves if you’re going for plenty of volume. Plus, it locks out Monica-style humidity (if you know, you know), making it the ultimate summer hair hero. If you have type 2A waves, getting locks straight is as easy as using a heat protectant spray and straightening iron. However, 2B and 2C waves may need a little more cajoling to go smooth and sleek. To get the look start by prepping hair with your Nutricurls shampoo and conditioner, then smooth 2-5 pumps (depending on hair length) of EIMI Flowing Form styling lotion through mid-lengths to ends. Mist EIMI Thermal Image heat protector over the top to safeguard strands against heat styling, then grab a large, round brush and blowdry locks with the nozzle pointing down the hair shaft so that the cuticle lies flat. Once hair is completely dry, mist on another layer of EIMI Thermal Image before straightening in sections. Then, tame any flyaways by dabbing on a small amount of our shine-boosting EIMI Oil Spritz. For those who can’t get enough of their curves and want to turn them into curls, the kind of look you achieve will come down to how much existing movement you have. Follow your hero hair routine above, then grab our curl-enhancing gel-cream, EIMI Nutricurls Curl Shaper Cream, and apply it to damp locks before scrunching as you dry with a diffuser. If you have 2A waves, you’ll then want to section hair off and use the Pro-Curl tong all over. You’ll get an ultra-polished curl effect that locks in place when you mist with EIMI Mistify Me Light. 2B and 2C waves should have got plenty of texture from blowdrying with the gel-cream, which can then be enhanced by using the curling tong only where more definition is needed. Now you know how to style and care for your waves, get some color inspiration. You’ll find endless looks and trends on the @WellaHair Instagram and Pinterest feed. Happy browsing!